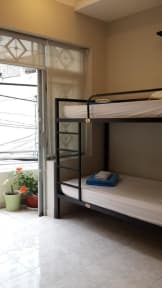 Long Hostel i Ho Chi Minh, Vietnam : Boka nu! Wonderfully friendly social and free beer, amazing breakfast can order twice =D but only one bathroom per dorm and one extra on the ground floor made it busy sometimes. Such a good hostel. The perfect vibe if you don’t want to stay at a party hostel but still want to meet a lot of people. The staff very super nice as well! I hurt my knee pretty bad and they were really caring and helped clean it and put a bandage on. Oh and the free breakfast was really good! Would definitely stay here again if I ever go back to Ho Chi Min! 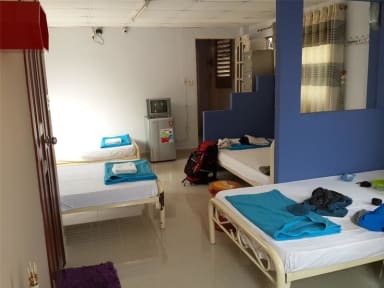 Long Hostel is a good and clean hostel. The breakfast that is included holds a high standard and they even change your towel, which also is included, once a day. Big up for the happy hour that allows you to enjoy two free beers every evening. One note.. The night shift guy could be a little bit more polite and service minded towards the guests.